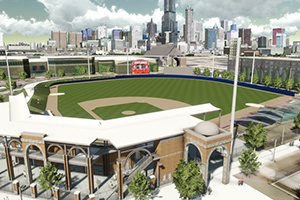 Plans for Curtis Granderson Stadium, a $7 million ballpark pledged by the UIC alumnus and Major League Baseball star, were approved May 29 by the University of Illinois Board of Trustees. Granderson, a centerfielder with the New York Yankees, announced his commitment to fund the new facility Feb. 6 at a campus press conference. “I’m grateful that I have the opportunity to team up with UIC, which has helped me get to where I am today,” Granderson said when he announced the gift, expected to be the largest ever made to UIC athletics. The stadium, located south of the Physical Education Building, will be home to UIC’s baseball team, where Granderson played outfield for three seasons until he was drafted by the Detroit Tigers in 2002. Read more at UIC News Center.